Have a letter you'd like to send out to your clients but the job is too large to photocopy? Do you send out statements on a recurring basis, yet do not have a budget large enough to staff someone full time to print and mail these? Data & Mailing Resources can accept data in virtually any format and print at extremely low costs. 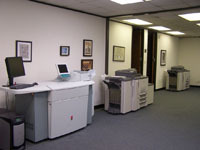 Variable data processing is easily accomplished in a room full of laser printers at the ready. DMR is capable of printing over 20,000 - 8 Â½ x 11 forms per hour. If you would prefer to print spot color on your forms, DMR has a digital press on-site that allows us to print in full color, with variable and static information.